Express orders will be processed within 1 business day. A physical address is required. Express orders cannot be sent to a PO Box address. If you indicate a Date Needed when selecting Express shipping, this gives us an idea when you would like your Express order to arrive. If no date is specified, your Express order will ship within 24-48 hours. Not all of the items on our site may be available immediately, so selecting Next Day, Two-Day or Three-Day shipping does not necessarily guarantee your order will arrive in 1, 2 or 3 days. Express Deliveries are not available on weekends (Saturdays and Sundays) or holidays. Please note: We are not responsible for any delays due to circumstances beyond our control, such as inclement weather or carrier delays. Regular delivery is via Priority Mail or UPS and requires 5-10 business days. Economy delivery is via the United States Post Office and requires 2-3 weeks. The recipient of an international order may be subject to import taxes, customs duties and fees, which are levied once a shipment reaches your country. Additional charges for customs clearance must be borne by the recipient. Vision Video has no control over these charges and cannot predict what they may be. Customs policies vary from country to country and you should contact your local customs office for further information. When customs clearance procedures are required, it can cause delays beyond our original delivery estimations. The rates below apply to all orders shipped to U.S. states and territories. Please see the checkout page for International and Express Rates after adding the items to your cart. Orders shipped to Pennsylvania (PA) and Tennessee (TN) will be charged sales tax for the respective entities unless the purchaser can provide a tax exemption certificate. Please fax your tax exemption certificate to (610)584-6643. Pennsylvania sales tax is calculated on the total merchandise purchased plus shipping charges. Tennessee sales tax is calculated only on total merchandise purchased. All other orders are not subject to sales tax. In order that we may provide you with the lowest possible price and best service, we ask that all orders be prepaid. You may charge to VISA, MASTERCARD, DISCOVER, AMERICAN EXPRESS or any PayPal™ payment method. Playing DVD outside of North America? DVD movies are coded by region so that movie studios can control where in the world their movies can be viewed. Hardware manufacturers encode DVD players for the regions where they are sold. We have attempted to include the "Region" on as many programs as possible. If you are placing an order from a country outside of the United States and its territories or Canada, and the region is not listed, please click here to e-mail us. Can I show the DVD in a church or school setting? Many customers ask us about showing video programs to church and school groups. The Motion Picture Licensing Corporation (MPLC), the group who has offered umbrella licenses to show Hollywood productions in public groups, has now teamed up with Christian Copyright Licensing International (CCLI) to create Christian Video Licensing International (CVLI). For one small annual licensing fee, you can obtain a license to show all Gateway Films/Vision Video releases plus most other Christian and Hollywood titles. The CVLI provides legal coverage for churches to show home videocassettes and videodiscs of motion pictures for a variety of church activities, whether the videocassette or videodisc was purchased, rented or borrowed. These may include church services and programs, education sessions and youth activities. For a complete listing of Vision Video/Gateway Films titles covered by CVLI, click here. This license does NOT cover materials that have been copied from another source or recorded from television. It also does NOT cover charging an admission fee for video showings. For more information on obtaining a church video license, you can contact CVLI directly at 1-888-771-2854 or visit their website. If, for any reason, a DVD does not meet your full expectations, return it to us within 30 days, and we will exchange it or refund the purchase price. We no longer accept VHS returns. Lost your return form? Download the form here. Do you offer a discount on large purchases? For those customers placing large orders and wishing to build a video library, we offer additional savings above our already discounted prices. For orders over $100, enter coupon code vd100 to save an additional 10% off the total price of your order. For orders over $250, enter coupon code vd250 to save an additional 15% off the total price of your order. For orders over $500, enter coupon code vd500 to save an additional 20% off the total price of your order. Apply the coupon code after adding the items to your cart. Please note: the additional discounts are based on the total dollar amount of the order before tax and shipping charges. This offer cannot be combined with any other promotions. If a video is available for download, you will see a choice to BUY NOW for a price. It will be added to your cart. Once payment is received, you will receive a download link that will allow you to download the entire video. The file is in Mp4 format. What programs will it play in? iTunes, Windows Media (after a codec download), QuickTime or VLC Player. Watch it on your computer or a portable device such as an iPod, iPad, certain Smart Phones and others. *If you are using an Apple portable device (iPod, iPad or iPhone) to download the file, please be aware that due to the device's limited search functionality, you may have difficulty locating the file again. Open the file in iTunes on the computer you synchronize with your portable device. After the file has successfully copied to iTunes, connect the portable device to your computer. Click on the portable device's name on the left side under “DEVICES”. Click on the “Movies” tab on the right. Verify the movie that you want to sync is listed. Verify the “Sync Movies” checkbox is checked and that all movies are set to sync or the movie's check box you want to sync is checked. The film will now be in your movies list in your 'iPod' app or listed in your 'Videos' app. How many times can I download it? There is a 3 download maximum. If you still need access after 3 downloads, contact Customer Service at 1-800-523-0226. Can I share it with my friends? No, the license is for your downloading only. Is your .mp4 Digital Video in the wrong language? 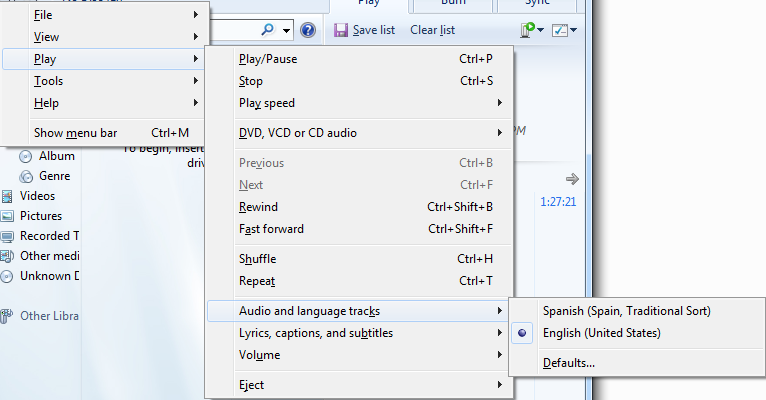 To change the audio in Quicktime, select 'View | Languages | English' from the main menu. 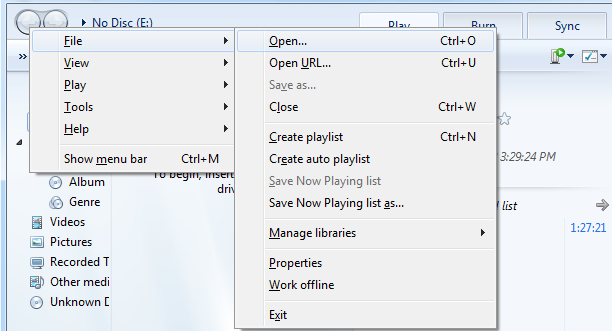 To change the audio settings in VLC (which can be downloaded from https://www.videolan.org/), select 'Audio | Stereo-[English]' from the main menu. 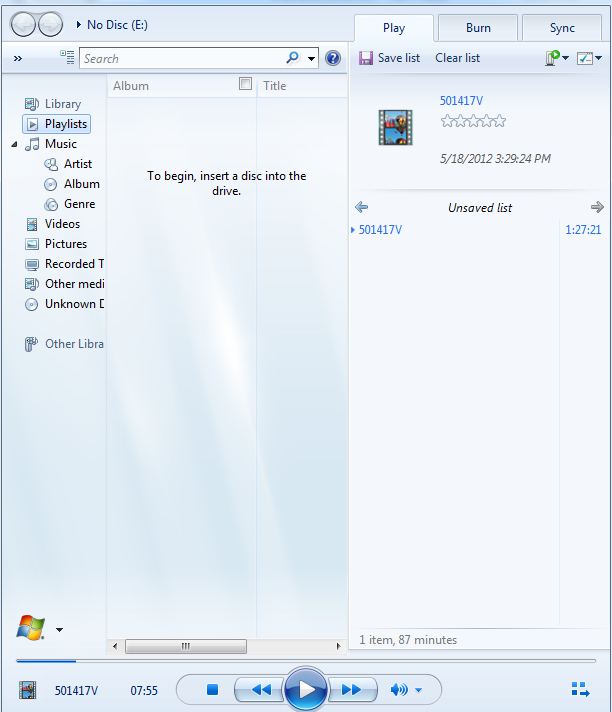 To change the audio language in Windows Media Player, click on the this icon in the upper right of the media player. This will reveal the player in this mode. You then have to press the 'Alt+F' key combination to bring up the Main Menu. Select 'Play | Audio and language tracks' and the alternate audio language desired. Click in this icon at the bottom right of the player to return to the video player.